Alain Prost won the final race of the season at Estoril, but by taking second place, Niki Lauda secured his third world title by just half a point from his McLaren team-mate. The fact Prost equaled Jim Clark's record of seven wins in a season was little consolation as he settled for the runner-up spot for the second season in a row. The fortnight leading to the grand prix had been dominated by endless media permutations as to what each man needed to do to take the crown. It was almost a relief when the action started although Portugal's first F1 championship race in 24 years was heralded by the end of a five-and-a-half month drought which all but washed out the Friday sessions. Given the closeness of the title race and the return of F1 after a long absence, the crowds were poor. Outgoing champion Nelson Piquet took his ninth pole of the year - chronic reliability issues with his Brabham meant he only managed five points-scoring finishes - with Prost alongside. Lauda again struggled and qualified back in 11th. Piquet spun on the first lap, Prost slotted in behind Keke Rosberg and Nigel Mansell, and Lauda started to fight his way through the field. Prost passed Mansell on the third lap and took the lead eight laps later before cautiously easing clear of the field. Barring mechanical failure it now all depended on where Lauda finished, and it had to be second. He picked off Elio de Angelis' Lotus and Stefan Johansson's Toleman, surviving a brief scare when he clipped the latter as he passed. He then overtook Michele Alboreto's Ferrari to take third. Nigel Mansell was 37 seconds ahead in second but he started leaking brake fluid and 18 laps from the end he retired. "I'm just so upset," Mansell said. "There was no way Niki was going to catch me. I feel like crying." Prost was given the news over the radio but there was nothing he could do other than push on to victory and hope. 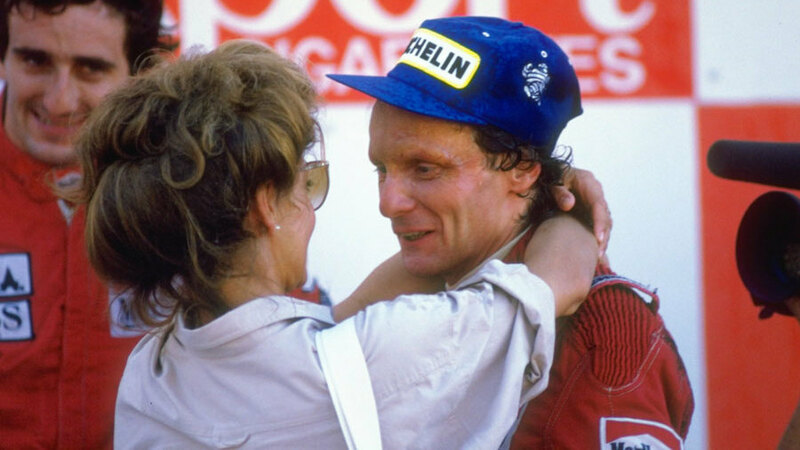 Lauda was equally cautious over the final laps, cutting his pace by three seconds to conserve fuel and tyres. "If you don't finish you're not world champion," he said. "That last lap seemed one of the longest of my life." Ayrton Senna marked his final outing for Toleman by taking third - ensuring a world champion from the 1970s, 80s and 90s was on the podium - although he was almost caught by Alboreto as he too slowed to conserve fuel.